A new 16-stream die developed by Baker Perkins increases the output capability of Baker Perkins’ co-extrusion systems for snacks. The die, with a previous maximum of 12 streams, is a key part of the CoEx Master™ System, producing snacks containing two components - a cereal outer and a centre filling. Fillings with contrasting tastes and textures are incorporated into the cereal tube emerging from a twin-screw extruder. 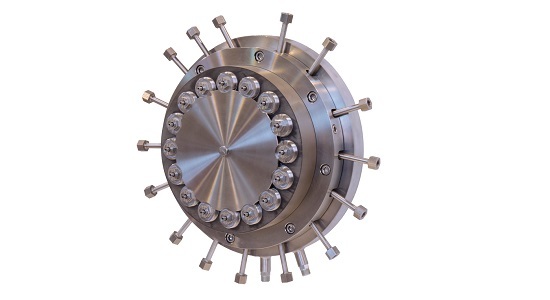 It is formed into individual pillows, tubes, bars or wafers to create high added-value products in sizes ranging from small bite-size up to sticks. Extrudate and filling are combined into concentric streams at the die, with the flow at each outlet individually adjustable for consistency and weight control. Fillings can be of virtually any colour or flavour – sweet and savoury creams, fruit pastes, chocolate praline and cheese are typical, and innovative snacks can be developed using different flavours in the filling and coating. In addition to familiar, conventional flavours, Asian, Middle Eastern and Hispanic tastes are increasingly popular. Chilli, paprika, teriyaki, guacamole, sweet and sour, black bean sauce and a wide family of curries can be used individually or in combination to produce snacks with high consumer appeal. Baker Perkins’ CoEx Master™ systems provide a wide choice of outputs, with die sizes now ranging from four to 16 streams. The systems also comprise a cream feeder which supplies the die, and a pillow-crimper, where product stream from the die is cut to length and sealed. Co-extruded pillow snacks can be made in novel patterns such as chevrons, waves and trapeziums. ‘Standard’ shapes such as squares can also be produced, with outline definition much improved compared to previous generation equipment. It is even possible to produce different shapes and flavours simultaneously for variety packs. CoEx Master™ systems can be part of a new extrusion line, or fitted as a straightforward upgrade to existing lines. 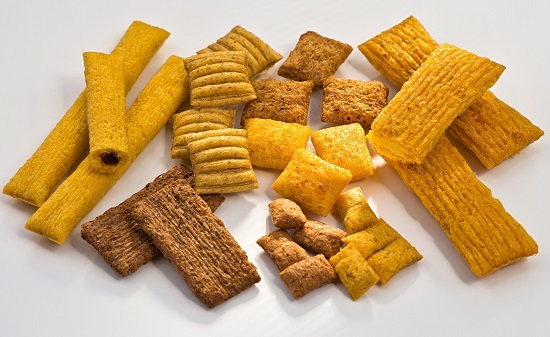 They are an integral part of Baker Perkins Snack Master™ flexible systems that enable companies to enter the market with an uncomplicated extrusion system making standard, direct-expanded snacks such as corn curls, chipsticks and maize rings, then add to it as business expands. A Snack Master™ line may be extended in stages to broaden the range of products that can be made to include both traditional and the new generation of indulgent or healthy snacks. These can include a full portfolio of high specification, complex products including whole grain / multigrain and sweet or savoury filled pillows. A standard line usually consists of a SBX Master™ twin-screw extruder, a dryer and flavouring system. Special dies and cutters, co-extrusion equipment, dryers, fryers, ovens and coolers can be added to form versatile plants. New products can be introduced quickly, and short-life products become a profitable option. Keith Graham at Baker Perkins. Tel +44 1733 283000. Alan Burgess at A & A Marketing. Tel +44 1733 390227.